Because of her position at the southern tip of the Indian Sub-Continent Sri Lanka is often referred to as the Pearl of the Indian Ocean. In recorded history for over a thousand years travellers from all over the world came upon Sri Lanka or made the happy discovery by accident. Thus, this Isalnd Paradise was also called SERENDIP giving rise to the word 'serendipity' meaning 'making happy discoveries by accident'. In the more recent times the strategic position of Sri Lanka (or Ceylon) became a magnet of attraction for the Western traveller or explorer to visit Sri Lanka. In the early 16th century the Portuguese were the first European power to realize the importance of Sri Lanka. Sri Lanka became a centre of the spice trade between the East and the West and the Portuguese were the first Europeans to set up their trading posts in Sri Lanka. They came in as explorers and traders and in due course schemed their way into becoming the masters of the coastline or the maritime areas of the Island. The Dutch followed them in the 18th century, but both these European nations could not capture or control the whole of the Island. The core or heart of the Sri Lankan nation survived the onslought of these two European powers until the beginning of the 19th century. It was only the British who came in the late 18th century and replaced the Dutch, were able to take control of the whole island in 1802. Thus Ceylon became the first Crown Colony of the British Empire in the East. A more realistic explanation for adopting the Lion as the national symbol was perhaps that the Lion represented the bravery of those early settlers (or sailors who crossed the Bay of Bengal) from North or North Eastern India and who spoke an Indo-Aryan dialect. 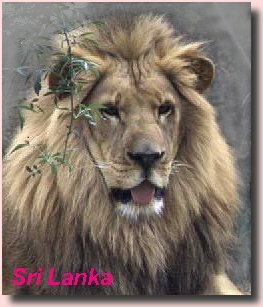 The lion though not native to Sri Lanka is the most important animal to the Sri Lankans. The national flag of Sri Lanka proudly displays the picture of a lion holding a sword. The legend goes that the first settlers of the Island of Lanka, who came from north India had their ancestry with a tribe or group of people who venerated the lions. The majority community of Sri Lanka are called "Sinhalese" meaning descended from a lion (or "Sinha" the Sinhalese word for lion). Whilst the lion represents the Sinhalese community on the flag, the green and orange strips represent the minority communities in the Island. Sri Lanka has always been a modern secular democracy, with a written constitution safeguarding the rights and privileges of every citizen irrespective of their ethnic origin, colour, creed or religion. Are you bored visiting those same old European, North African or Mediterranean resorts every year? Then Sri Lanka is the answer for you. This picturesque island in the Indian Ocean offers an exciting change of venue and a range of scenery for the discerning traveler. In comparison to many other destinations, Sri Lanka gives you better value for money. Try it for a change and you will never look back. I have made it my mission to publish as much information as possible about Sri Lanka. I have set up a number of websites with other sponsoring bodies (as listed below) to bring you the message of Sri Lanka, and give you a bit of the Taste of Paradise. You are gladly invited to visit them by clicking your choice, but please do not forget to return to THIS website by using the "Back" button of your Browser. Netscape Tripod UK-2 Line One Net under constr..